Rotorua's Te Puia Thermal Reserve - We like to think we're in control but a wander through this reserve will soon have you rethinking things. Mother nature has got us firmly by the reins here with an impressive array of mud pools, boiling hot springs and gushing geysers. You can walk through the reserve with a map in hand or take advantage of the Te Puia guided tours that run hourly. It's really good to go on one of these as I think you get to make more of a connection with the land and the people when you hear the stories and the history. Prices begin at $56 for entry which includes the guided tour if you prefer that. It's highly likely that your guide is descended from the original guides in the valley. They have entertained royalty and other famous people over a lot of years. After that, wander around on your own for as long as you like because, as in the other geothermal areas in Rotorua, there is lots and lots to explore. Shrubs cling tenaciously to rocks oozing steam and heat. It's fascinating to see the range of thermal activity going on in the valley and quite a sensory experience actually. Steam creeps out of fine cracks in the rocks everywhere, and it winds around stubby little manuka shrubs perched perilously on ledges (pictured above). I don't know how the plants survive (over 500 varieties although you wouldn't think so) but they do. 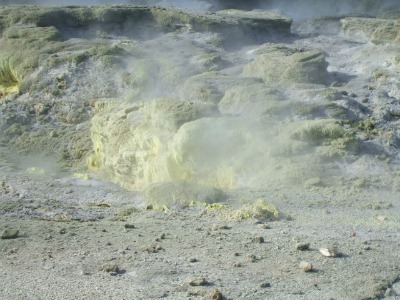 Even in some of the boiling hot pools there appears to be some type of plants or algae growing. 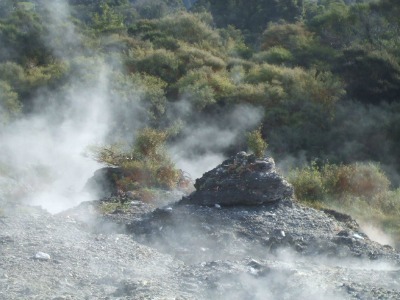 When near the famous Rotorua Pohutu or the Prince of Wales Four Feathers geysers, expect to feel heat… and fine, damp droplets of geothermal spray and steam. It can completely envelop a person as the breeze moves it around. Never to forget that with all this is the ever-present smell of sulphur wafting up the nostrils. 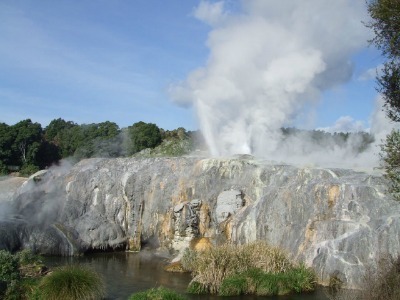 With all the geysers, hot pools and mud pools to see you can spend quite a bit of time in this Rotorua valley. Little tracks go off in different directions so you are right in amongst it all. A couple of times it crossed my mind that I was walking on veeery thin ground... spooky. Te Puia is not just about the geothermal activity. It's also the home of what was once known as the New Zealand Māori Arts and Crafts Institute, now our national schools for wood carving (Te Wānanga Whakairo Rākau), weaving (Te Rito) and stone carving. Would be students apply from different tribes around the country to attend the 3yr diploma courses taught by master craftsmen... and craftswomen (I just had to add that). Māori wood carvings in the Te Aronui a Rua Meeting House at Te Puia - made by carvers from the school. This is how the knowledge of Māori arts & crafts is passed down through the generations, retaining precious links to the past all the while moving forward to greet the future. A lot of the graduates go on to make careers out of their chosen discipline with artworks commissioned from all around the world. Iwi Le Comte, one of the many carving school graduates is a great case in point. Visitors can go through the schools to watch and speak with both the students and tutors at work. 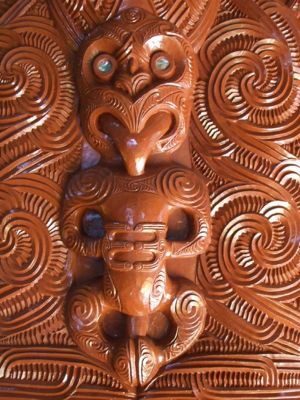 James Rickard, one of the tohunga master carvers, has a wealth of knowledge about this art. I love listening to him speak about it because he brings the subject alive. He talks about carving being a language, just like hieroglyphics, and about how part of the art is listening to what the adze is doing - listening to the creation. NB: I didn't get into Te Puia's schools the day I visited. Will update once I do. Yes, there is still lots more which I will briefly mention... it could turn into a book otherwise. Te Puia has its' very own Kiwi House where a breeding programme is carried out. Trying to keep it as natural as possible for the Kiwi's, there is very little human contact which also means the viewing room is dark. No photos I'm afraid. There is also the Rotowhio Marae where you can go into the meeting house either to have a nosy or watch cultural performances. Te Puia offers a number of Experiences that can include the cultural performances, steam hangi meals, night tours of the park etc. The Pikirangi Māori Village is set up as an example of what an ancient Māori village would have looked like. Can't say I would have liked to live back then, I like my modern-day comforts too much. Finally, the Ngā Waru Pū Manawa Gallery showcases visiting exhibitions as well as acknowledges the generations of guides in the valley. Whew huh? All of this, apart from the add-on Experiences, is included in the entry price to the park. 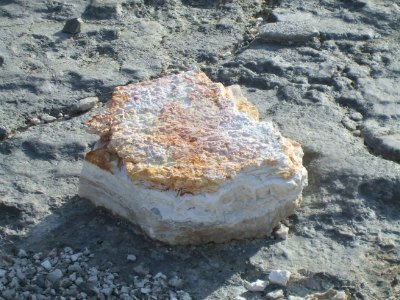 Te Puia Thermal Reserve is open 365 days a year. The last tours of the day begin an hour before closing. The google map shows directions from the i-site information center on Fenton St.
Te Puia Thermal Reserve has a very nice onsite cafe by the name of Pohutu Cafe… of course. Light foods and snacks are available along with meals. Oh yes, before I forget, apparently they have yummy New Zealand ice creams as well. 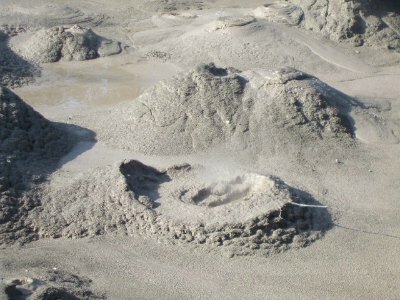 Te Puia has two large carparks with transport available to the entrance from the furtherest one. They take buses and campervans and there is mobility parking spaces. The carparks are manned with security which is great to see. Toilets are dotted around the reserve which can be viewed on the map provided on entry. All ages but in saying that, with children be super, super careful, we all know how curious they can be, bless their little cotton socks. Wear sturdy footwear as you will be walking over rough, stony ground. Water and sunscreen for the summer is highly recommended and raincoats and umbrellas if it's wet. Is Te Puia wheelchair friendly? To get around Te Puia thermal reserve would take in excess of an hour, maybe even two. I was in there going on for 2hrs taking lots of photos, going up every little track and I didn't even get to the carving and weaving schools. Have to go back another day for that so I'm lucky I have that luxury aren't I? Are there educational programmes available? Yes, there are programmes along with discounts and concessions. They cater for school groups from both here and overseas. Does Te Puia thermal reserve have discounted rates for seniors? Yes, but sorry to say, only for New Zealand citizens who have to be over 65yrs with identification.